Tabbloid is a very good and interesting service to turn your own blog RSS (or any other of your favourite blogs RSS) into a personal magazine. Exactly speaking, it’s a sample service to turn your blog RSS into Adobe PDF document, so that your readers can read your blog in any PDF reader. Your blog is published another way, this is how we call it a “personal magazine”. Pro Design (Tabbloid not only turns your blog RSS into PDF, but also publish it with a Professional design). Automatically delievery (As you can see in the above picture, Tabbloid sends a copy of magazine it created to your mailbox at a time you specified). 1-step Setp (Yes, it’s so easy, only ONE step, input your feed address(es) as well as your email address, and tell Tabbloid when to email you your magazine, and then save your delivery option). Free (no account) required (Yes, totally free, after you saved your delivery option, the only thing you need to do is to verify your email address in your mailbox). Here’s an example of my personal magazine created with my own blog. Download here. Another similar service which allows you to publish your own newspaper from your own blog feed is FeedJournal, FeedJournal Publisher is a one-stop service for generating paper publications from your aggregated online content – an attractive offering to your readers. Online newspapers: Offer your readers a paper version download. Bloggers: Have your vistors read your content uninterrupted, offline. Businesses: Publish a newsletter with up-to-date information from various departments within your organization. Just input your email and your RSS feed address or your blog, when finished, open your mailbox for your newspaper download link, here’s an example newspaper created with my own blog RSS. Download here. Both of Tabbloid and FeedJournal can turn your blog RSS into PDF document, as you can see my examples, Tabbloid’s PDF is more likely a magazine, and FeedJournal more likely a Newspaper in designing and layouts. But all of them can’t convert images in the Feeds into the magazine or newspaper. It’s a shame. Correction: Mr Jonas Martinsson left me a comment and said FeedJournal does convert images to the PDF format newspaper, both in the free and paid services. Tabbloid has more features than FeedJournal, but if Tabbloid has more options to send the magazine to a number of email addresses, it would be much appreciated, you can really turn your blogs into a personal media to publish your own magazine on the net. We know that both Tabbloid and FeedJournal’s magazine or newspapers are created from your blog feed RSS, I searched on Google and found two more services. 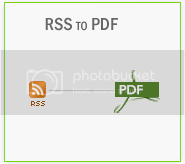 RSS 2 PDF has a feature which you can put a link on your website, for example, http://rss2pdf.com?url=http://www.yourdomain.com/rss/yourfeed.xml, your readers can download your PDF version anytime they wish. RSS2 to PDF allows you to convert multi-feeds (no more than 5) into PDF a time with customized fonts. If you are interested in it, please have a try. xFruits is another RSS2PDF creator, it has a lot of functions, such as RSS to MAIL, RSS to WEB, RSS to MOBILE, RSS to PDF, and so on, let’s see it’s RSS to PDF feature only. The last, the best, xFruits is an easy-to-use RSS2PDF creator that I’ve ever seen, images can be converted in the PDF with a Simplefied Chinese support (all others don’t have), and a better design too. Please Download here for an example, and I think you will like it. To publish a magazine, I choose Tabbloid, to just convert RSS to PDF document, I choose xFruits. To convert your blog RSS into a newspaper, I prefer FeedJournal. What’s yoru choice? Please don’t forget to download my PDF version of my blog of the latest 10 posts. Thank you for taking a look at FeedJournal. A small correction: FeedJournal does convert images to the PDF format newspaper, both in the free and paid services. @Jonas Martinsson, I am really sorry but I've corrected this error. I really didn't see the images in my newspaper when I wrote this article. I don't know what's the problem. 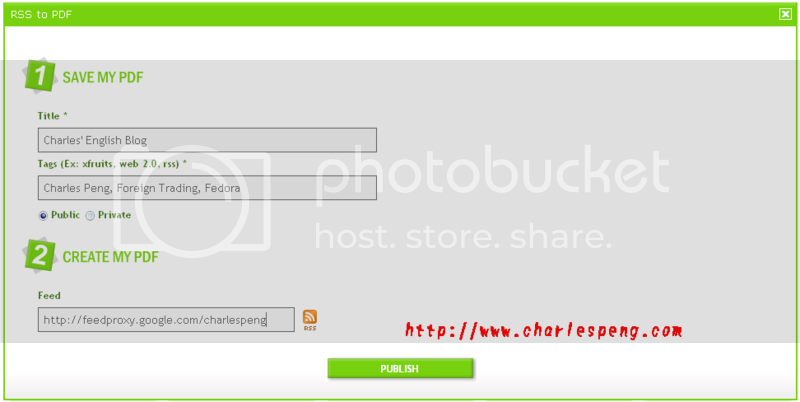 FeedJournal can't convert my images in the blog posts into PDF.